It feels like online marketing has taken over, and it seems like there is an endless range of internet advertising strategies your business could benefit from. The biggest problem most veteran business owners have regarding internet advertising, is they don’t know which of these strategies is right for them. To help, we’ve put together a simple guide to explain a few internet advertising strategies, that are proven to drive sales and increase website traffic in 2019. Search Engine Marketing is the process of getting your business found in search engines by potential customers, who are searching online for the products and services you sell. It is estimated that there are approximately 63,000 Google searches per second. With so many people searching; Google and other search engines can provide great source of online exposure to potential customers. There are two main methods of search engine marketing; Search Engine Optimisation (SEO), and pay-per-click (PPC) advertising. Searching Engine Optimisation is the art of improving a websites position in the organic (non-paid) search results for a search phrase a potential customer is likely to make. PPC advertising on the other hand, allows advertisers pay to get their website at the top of the search results for their chosen search query (keywords). With pay-per-click advertising, the advertiser only pays if someone clicks on their ad. Advertisers place ‘bids’ on how much they are prepared to pay per click for a particular keyword. The most popular pay-per-click platform is Google Ads. In the image below you can see Google Ads at the top of the search results. Google Ads have a green ‘Ad’ badge to the left of the website’s domain name. SEO is a very advanced form of online marketing; it is best handled by an experienced SEO consultant. A basic strategy begins with keyword research. Keyword research is the process of finding the keywords your customers search to find businesses like yours. Keyword research also involves investigating monthly search volumes for these keywords, and level of difficulty to get your website ranking for the keyword. Google Keyword planner is the main tool used for keyword research. With Google Keyword Planner, advertisers can find monthly search volumes for keywords. Once keyword research is complete, the SEO consultant or website developer will optimise the websites code and content for these keywords. In addition to optimisations to the website, SEO involves off page tactics such as, building links to the website from other websites, and listing the business on online directories. Just like SEO, a pay-per-click strategy begins with keyword research. With PPC however, the advertiser with usually choose more keywords to include in the campaign. Once the keywords have been decided, the advertiser will create specific ads for the keywords. For example, a law firm that offers both family law, and compensation law services will create specific ads for each service, and select the keywords they want to trigger the ads. Out all the online advertising strategies you could find on the internet, sales funnels are probably one of the most popular. The use of sales funnels has increase significantly in the last few years, due to their proven ability to generate leads and drive sales. Awareness: the advertiser creates awareness by promoting content that will attract potential customers. At the awareness stage, the goal isn’t to make a sale, but instead to motivate the user to opt into the next step of the funnel. For example, an advertiser might offer a free eBook, webinar, or access to exclusive content, in exchange for the prospects email address. Interest: At this stage, the advertiser has a refined list of email addresses, made up of people that are interested in the services offered by the business. The advertiser will then promote the product or services to this list, to stimulate the prospects interest. Again, the second step isn’t used to sell the product or service, it is used as a chance to promote it further. For example, at this stage a free consultation could be offered. Decision: It is at this stage in the funnel, that the offer for the product or service is made to the customer. At this point the advertiser has a list of qualified leads. At each point in the funnel, the advertiser has had a chance to promote the product or service directly then they would with just a single ad. 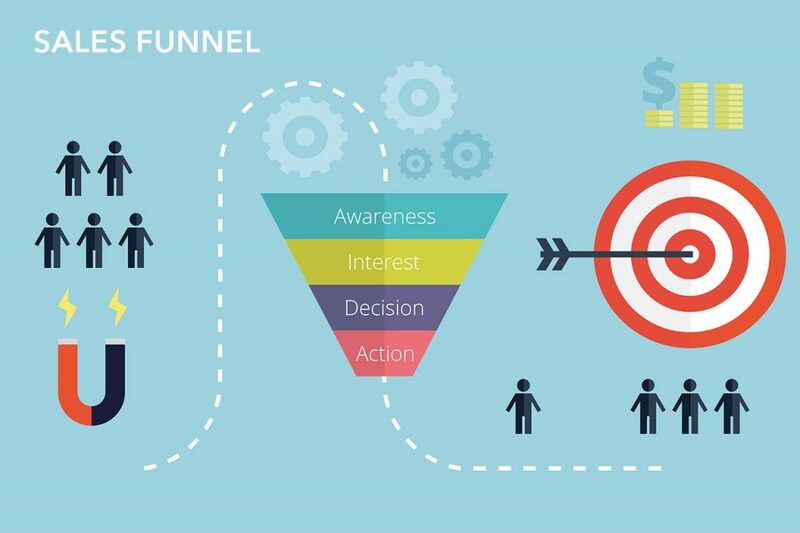 Action: At the end of the funnel the prospect will either purchase, or not. Regardless of the decision, the advertiser will usually place them into a new funnel either to upsell them on an additional service, or a new funnel to try to convert them into a buyer at another stage. Stage 1: An accounting firm offers a free downloadable guide called ‘10 ways small businesses can reduce their taxes’. To download the guide, the user must provide their email address. The advertiser knows anyone that downloads this guide is potential client. Stage 2: Once the eBook is downloaded, an automatic email sequence is sent to the persons email account. The emails are case studies of happy customers, and the results the accounting firm has achieved. At the end of each email, there is an offer to book a free consultation with one of the firms Accountants. Stage 3: During the consultation, the Accountant can provide specific details on how they can help the client and meet their needs. It is at this stage they will present an offer to use one of their services. Stage 4: If the prospect chooses to use the firm’s services, then they usually will begin an upsell funnel to promote additional services to the client. If the prospect decides not to use their services, they will be sent a series of follow up emails and calls with the intention of converting them at a later date. Social media is has become an extremely popular platform for businesses to promote their services. The dominate social media platforms are Facebook, Instagram, Twitter, LinkedIn, and Pinterest. One-way businesses can use social media to build a following of potential customers is by using education-based marketing. Education based marketing works by creating and sharing high-quality, educational content about the products or services you offer. Most people like to do their research before they engage with a business. If you’re producing the information they are looking for, prospects will view your business as an expert in the industry and likely follow your social media page to be kept up to date. You may have noticed after visiting a website, you start seeing advertisements on the internet for the same business. This is known as retargeted marketing. It works by placing a tracking code on the website that tells Facebook and other retargeting providers that a user has visited the website and to display a certain advertisement to the user. Typically, about 5 – 10% of website visitors will engage with your business after they visit your website. Retargeting helps keep your business in front of people that have shown an interest in your business but may not have contacted you. A very popular social media campaign used to build an audience are ‘like and share’ promotions. It essentially is a competition that encourages users to like and share a Facebook page, for a chance to win a prize. It works as a form of viral marketing, since the pages audience grows exponentially with the more people entering the competition. In addition, competition participants are effective advertising your services for you. The key to a successful like and share campaign, is to offer a prize that will attract potential customers to like your page. For example, a gym could offer a free one-year membership as the prize. Most people that enter the competition will be potential customers, since people who have no need for the membership, typically wouldn’t enter the competition. This is a great way to build your audience of potential customers quickly. Once the campaign is over, you will have access to an audience of people on your social media platform that have an interest in your service.